I want to know how the foil will be added to these machines? I had posted before, concerning purchasing a Krause, but can’t find the contact. I am looking into these presses and am unfamiliar with the operation with Foil stamp. On these models there is no rollers for the foil? Has any one used something similar? Also I’ve checked some in the discussions for special polymer used in hot foil, some mixed info. Do you think it will work on these types of presses? the last one has rollers, but a bit too much machine for me. What are you planning to print? Most of these larger presses were not designed to print paper goods but instead things like leather, textiles, plastics, etc. it’s generally a slower process using sheets of foil instead of rolls. many of these old machines may have used “Gold Leaf” …Real gold hammered to a thinnest layer as to still see it as gold but so thin,,, (microns thick) as to be able to apply it with some heat… really old school stuff.. They were originally called arming presses, from use in applying gilt coats-of-arms to bindings. The earliest arming presses had hollow recesses for heated iron bars, and you can see such on two of the presses shown above. Gas or electric heating elements came later. And here you can download the Karl Krause catalog (over 500 pages) with plenty of information on their machines. Foilng- as a student back in the 60’s the foil was cut from the roll and placed on the area to be foiled. In some instances the object to be foiled was blind blocked first before putting the foil on. 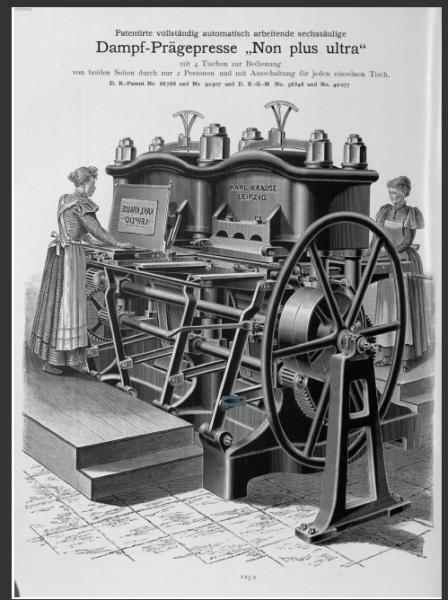 thanks all for the info… the cataloge is killer, especially luv the Victorian ladies running the monster presses, though I worry with the aprons and all those grears. My German is null, I have a friend maybe can help out. The Video gives me a good Idea, more for hand made crafted Items , not really a production print tool. I have a few hand presses, and am a bit torn in diversifying my studio. I mostly do small print runs on a Windmill, and Korex proof press. 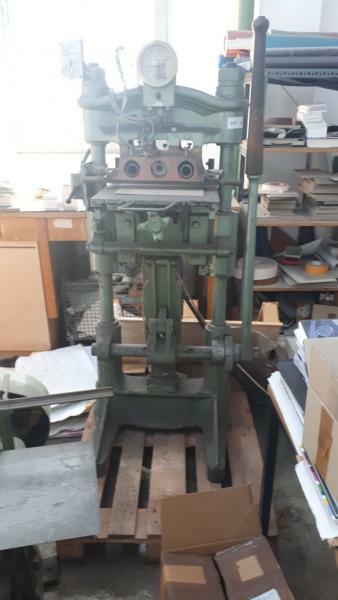 There aren’t many Kluge presses here, but quite a few Krause and Fromm & Polygraph in europe. is where the foil runs vertically, but the disadvantage is that in vertical format the capacity of the feeder reel is limited.! with the *REDBALL* Heidelberg Platen, with >lock out < Roller Arms, the capacity is vastly improved. ?!?! Interesting stuff here; I’ve had several Heidelberg windmills setup for foil The only factory unit was our 13 x 18 GTP, which ran a 16” x 400’ roll on a 1” core. 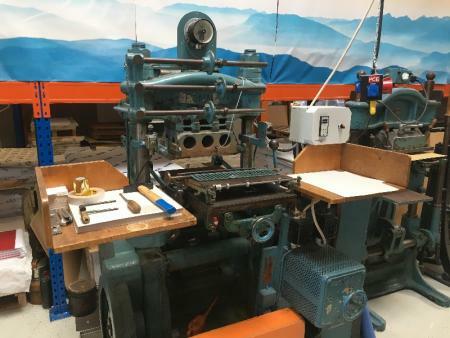 That was a very cumbersome press, I was glad when I sold it. My favorite setup was on our 10 x 15 presses. We bought new foil units from Jim Tredennick in Calif. They were air driven, and we could run a 2000’ x 9” roll off the left side- it pulled directly across the front of the hot plate, onto a rewind roll around the back. 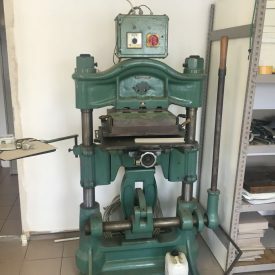 Great for whatever we could get on the press. I think on one of our older machines we ended up removing the arms permanently. The newer red balls had the lockouts which are the way to go. Watch out, some of the early red balls didn’t have the lockouts. Thanks for the info- I can’t really fit a second Heidelberg Platen press in by studio, about all full up. I was thinking of clearing out the the garage but that’s a whole other renovation. No one has info on the polymer plates for foil?? Metal backed polymer plates are used for foil. Search google: “polymer plates for hot foil stamping”.